Final Trim: Is it Safe? 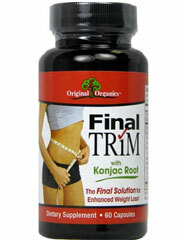 Final Trim is a diet pill claiming to work by detoxifying the body and helping with hunger. The product alleges that by utilizing a type of fiber - glucomannan - their product effectively helps consumers lose weight in a natural, healthy way. But does the product really work? Our team of weight loss enthusiasts spend hours researching the latest products to bring our readership proper reviews on health and diet supplements. By way of our three criteria product rating system - 1) the science behind the product, 2) customer feedback, and 3) the company behind the product, we provide consumers with an all encompassing review of the product. So let’s take a look at Final Trim! The first step toward understanding a product is understanding the company behind the product. However, Final Trim unfortunately does not make this easy. There is no company website that we could discover and right off the bat, this is a tremendous red flag. The product has no official contact information and essentially no way for the consumer to receive any type of customer support. Moreover, Final Trim has several scathing write-ups on Ripoff Report, claiming that Final Trim automatically billed and did not let the customer cancel their order despite the product’s failure to work. So buyer beware: despite being unable to find a proper product website for Final Trim, we were, however, able to find several ripoff claims online. So what is inside Final Trim? Final Trim claims to block hunger and detoxify the body. This is achieved by the product’s use of glucomannan, derived from the Konjac Root. Although several products in the weight loss world do incorporate glucomannan, it is worth noting the potential negatives that could result from taking this product. For one, glucomannan works as a fiber, expanding once inside the stomach and therefore making the consumer feel full. However, according to WebMD, glucomannan is rated as “possibly unsafe” for adults due to the fact that sometimes this fiber expands too suddenly in the capsule and causes blockage in the throat or intestines. And secondly, glucomannan is not recommended for people with diabetes seeing as it expands in the body upon absorbing water and may interfere with blood sugar control. Additionally, our team was unable to verify the exact amounts of each ingredient in the product and this lack of information, again, is a major cause for concern. Lastly, there is no conclusive evidence of this product’s effectiveness. We could uncover no clinical studies, tests, or procedures proving Final Trim consumption directly correlates with weight reduction. So ultimately, where is the information? Final Trim is a product worthy of much skepticism. The company fails to provide even the most basic information such as an address or telephone number. Moreover, the product is not forthcoming in the least with their ingredient information, aside from containing an unknown amount of glucomannan. In our team’s recommendation the consumer would be vastly better off going with a product that incorporates a solid customer support system, refund guarantee, list of ingredients, and clinical proof of the product’s effectiveness. By this criteria, Final Trim fails in every aspect and we do not recommend it in the least. Bottom Line: Final Trim offers no company website, no ingredient information, no telephone number, and therefore customers should waste none of their time with this product.